How could i change the banner header for another picture? But i don't want to change ALL template, only the banner for another picture... how could i do that? How can I change the banner picture? Is it just me or does commenting not work on this template? this template does not accept comments. 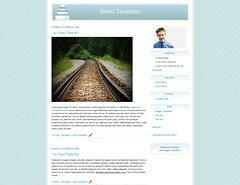 1) Blog description or H2 or header 2 whatever you call it is missing. 2) Cant change header completely! And can't remove that leaf from every post. You can change whatever you want in the template. You just need to follow the links to the .css files, and copy-paste directly in the template. After that you're free to change anything! We are a photographer and I may be able to help. Please get in contact we with at savannah wedding photographer and we can discuss the sort of service your after and I will be able to provide you with a quote. I am confident I can provide a price cheaper than any other quote. Plus the quality is exceptionally high. Hare you also get some examples of our work. is this template still available? i would love to use it!